We have to admit that we totally swooned when a picture of this cake appeared in our inbox. It is all kinds of awesome and we reckon that even if Arsenal are your team’s deadly rivals – or even if you don’t give two hoots about football! 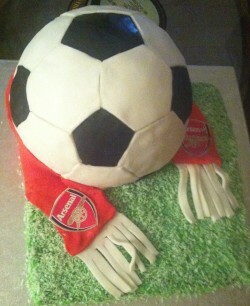 – you’d probably still bite someone’s hand off to have this as your birthday cake, although you may piggle off those Arsenal logos first! Like we said: T O T A L L Y swoon-worthy! Mix all ingredients, except water, until well-combined. Slowly add the boiling water and mix until smooth. I made two batches of this very easy, basic chocolate cake and divided the batter between two hemisphere tins and one shallow rectangular tin. If you’re fancy you will have two hemisphere tins, but I just have one, so I had to bake my hemispheres one-at-a-time, which took a while. I was a bit worried about having a gap where my hemispheres met, but the secret is to cool your cake in the tin and cut off any excess cake that rises above the rim of the tin before you turn it out. I used Wilton cake release in my tins to ensure they came out perfectly – I didn’t want a sphere that was anything less than spherical! 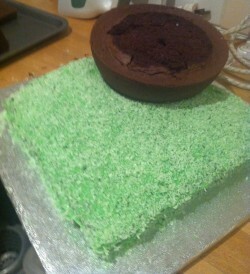 When the cakes were nice and cool, I iced the rectangular cake with green buttercream icing, as a kind of crumb coat. 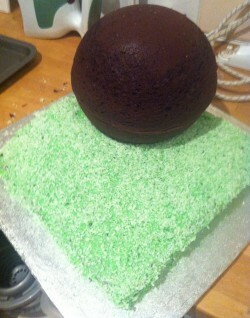 I then covered the cake with green-tinted desiccated coconut. I have wanted an excuse to make coconut grass ever since I was a kid and my mother made me a log cabin birthday cake, with grass, trees and flowers out the front. It’s easy to do: fill a zip-loc plastic bag about half full with coconut and add in green food colouring a little at a time. Mix it about really well in the sealed bag, until you’re happy that all the coconut looks green. 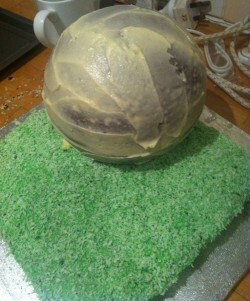 Next, I sliced just enough off the bottom of one of the cooled spheres that it would sit flat on top of the ‘grass pitch.’ I joined the two spheres together with buttercream, making sure all of the cakes sat on each other nice and securely. 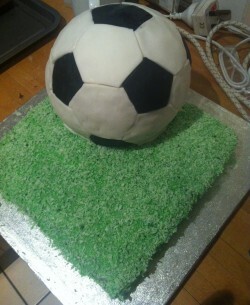 Then I covered the football with a crumb coat of buttercream. If I was a pro, I’d have a set of pentagon and hexagon cutters to make the next step really easy. I don’t so I made some paper templates. I rolled out black and white fondant icing and cut the shapes out using the templates. Be careful to keep the white and black shapes separate, as the white fondant picks up marks easily. I stuck one of the black pentagons on the football first, and placed white hexagons all around it – look at a real life football or use a picture of one for reference. Keep going until you’ve covered the sphere and – voila! – it will look like a pretty convincing football! 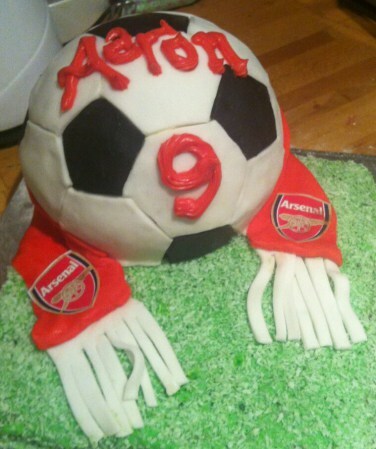 Finally, I rolled out fondant icing in the colour of the football team – in this case Arsenal – and draped it carefully around the base of the ball. It’s a good way to disguise the join where the ball meets the pitch. Make sure the fondant is nice and thick so that it doesn’t tear or break when you’re manipulating it. I used white fondant, with slits in it for the tassel fringe on the ends of the scarf. I printed out the team logo in colour and added this to the scarf. 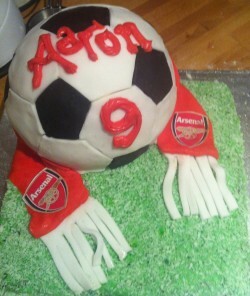 This is the eighth cake I’ve made for Free Cakes for Kids Hackney over the past year. I am delighted to volunteer with the charity and am sure I enjoy making the cakes even more than the kids and families enjoy receiving them. Every cake is a challenge and a chance to try something I would never otherwise have the opportunity to make. I don’t know anyone who would want me to make them a football cake so getting to bake this cake was a wonderful experience for me. I have very happy memories of the spectacular cakes that I had for my birthday parties as a child. It seems like such a small thing, but if a birthday cake can help make a child’s special day that bit sweeter and more special, then to me that’s no small thing at all. I would be chuffed if any of the cakes I’ve made live on in the memories of the families and children who receive them – but I won’t be offended if they don’t either!